I made dinner for my family Monday night. Without warning, my mom announced to me that I was going to cook for them. Mind you, I did this in the middle of finals week as a way to dodge my responsibilities. More importantly, this meant I wouldn’t have time for the gym. Naturally, I agreed to cook but spent the whole time commenting that I should be working or working out. Nothing like a little passive aggressive kitchen time. Needless to say in my slight annoyance, I didn’t really have a plan, but I knew I wanted vegetables. Rather than make a big grocery run when Mom has tons of food at her house, I decided I’d just fill in some spaces with items based on other items she had. 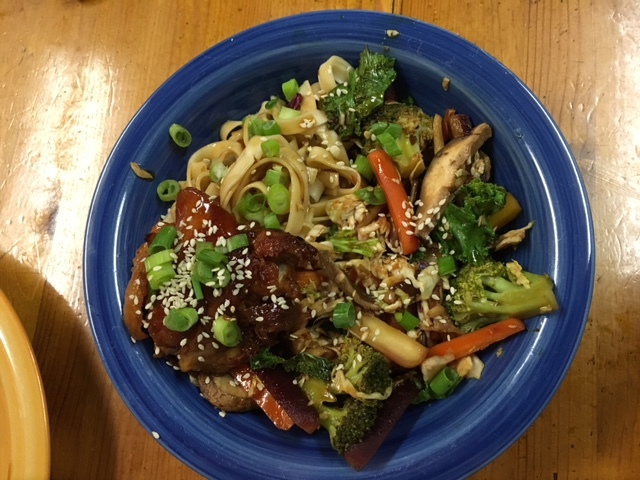 The result was SUPPOSED to be honey hoisin chicken and vegetable bowl over noodles. The path to that result, though, was not as simple as it sounds. You can skip ahead to the recipe portion of this; I won’t be offended. However, if you have a family with odd food habits like mine, read on for empathy. 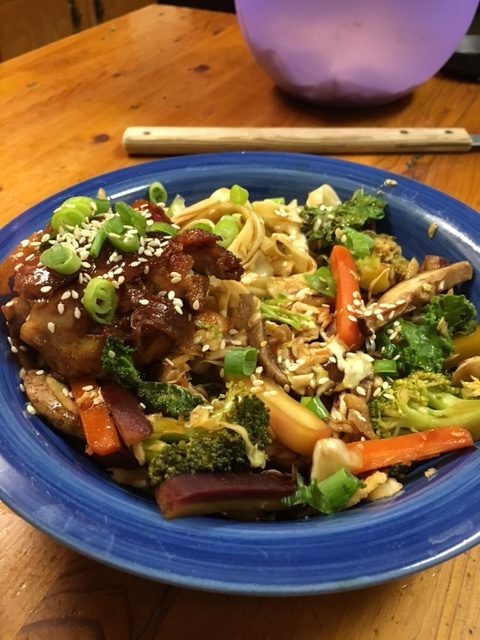 A look at a number of the ingredients that made up my honey hoisin chicken and veggie bowl. Note the presence of both rice and noodles. Picky eaters, man. 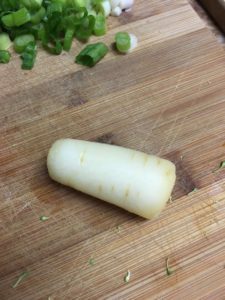 Let me give you a little background on food and cooking for my family first. My brother will eat nearly anything. I’m not saying he’s a mindless eating machine, but he’s willing to try anything you put before him because he, too, is a lover of cooking and food. His only limitation is similar to mine: no bananas in any way, shape, or form. Nope. Monsters. Terrible, smelly, weird, slimy little death sticks. 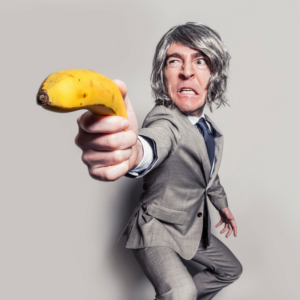 Luckily, banana isn’t a basic flavor element in everyday cooking, so we are able to easily steer clear of them. Seriously? If the grey-haired love child of Norman Reedus and Thom Yorke can wield a food as a weapon, it probably should not be food. Photo courtesy of Canva. 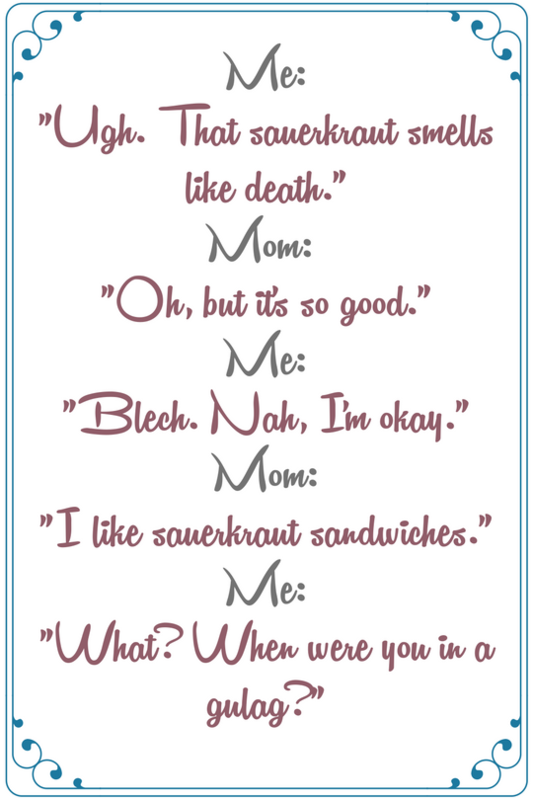 My sister will eat nearly anything–as long as it’s devoid of onions. Onion powder? Sure. Actual onions. No way. You can see the green onions in the photo, and, yes, I had to use them as garnish instead of cooking them in the dish. Here’s the great thing about her, though. She loves everything I cook. When we talk about something I make, she says, “You know you can’t ask me. I like everything you make.” She’s right. There is no objectivity anymore. Mom also doesn’t like pasta or pizza. Well, that’s a stretch. She likes pizza once every six thousand pies, and she likes pasta only if it’s in meat sauce. That’s why you see both rice and lo mein in the picture. The rice was for mom, and the noodles were for the rest of us. Now you have a clearer picture of how I have to think when I cook for the fam. I mentioned earlier I wanted vegetables. I gathered coleslaw mix (because I’m too lazy for actual cabbage this week), broccoli, kale (not pictured because I found it later), an assortment of mushrooms (that smelled just like dirt when I opened them. Yum! ), and multi-colored carrots. The carrots included this white one below. Anyone remember Bunnicula? Bunnicula helped with dinner tonight. No? I’m alone. Okay. Well, Bunnicula was this vampire bunny that sucked the color out of vegetables and only the dog knew. Seriously. Just click above for proof I’m not nuts. At this stage, my plan for dinner was as scattered as my thoughts right now. I knew we had chicken ready to go, and I’d gathered a sufficient supply of produce. We also had a grain that would satisfy everyone. The challenge, then, was figuring out what to make everything taste like. 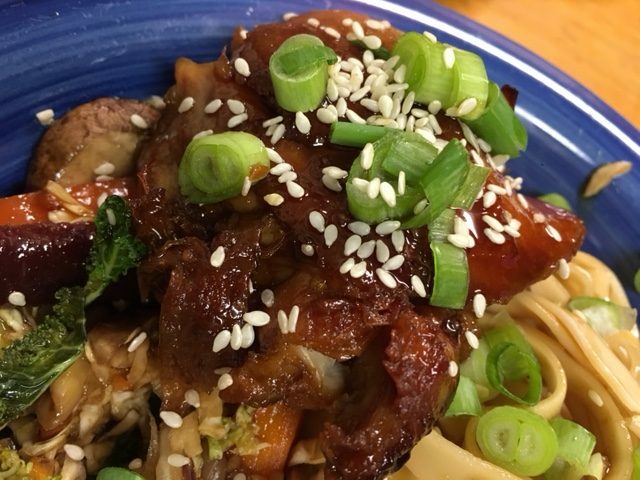 I don’t like bottled sauces like teriyaki or barbecue, so I try to make my own when I can (I have a great teriyaki sauce recipe for another day). This means I generally have the components of any number of sauces lying around at any given time. This night, I had everything I needed for a honey hoisin sauce, and I picked up a chicken broth just in case I blew it and needed to improvise. You never know. I suspected a complicated cooking event in my future, so I chopped the veggies before I did anything else. There’s a lot of garlic there, yes, but I used some of it to make the sauce and some to flavor the chicken as it cooked. A really helpful tip people have always told me and I only recently started following, it’s a great time saver to cut up everything and measure out whatever you can before you start mixing or cooking. It leaves time to either tend to an item as it cooks or clean up some of the flotsam before serving. Next, I put the rice in the rice cooker and the carrots, mushrooms, and broccoli in the steaming basket on top of it. I like to steam the vegetables only a bit, though, and finish them in a wok, skillet, or roasting tray depending on what I’m making. When I say “only a bit,” I mean they’re essentially just wet. 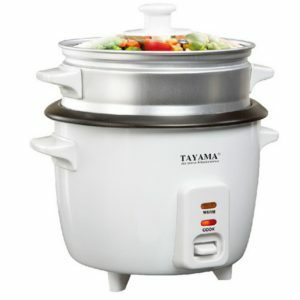 This is a bit tricky while cooking rice, however, because you have to be quick about it so you don’t ruin the rice. I pull the whole basket, put the lid back on the rice, and dump the basket into the desired receptacle. In that order. So far, so good. I have this $19.99 jigger from Home Depot. It’s a good thing to own. Click and buy one. Speaking of rice, cooking brown rice in a rice cooker is not always a win. I’ve made some weird rice-type final results over the years by being lazy with the water or not paying attention when the switch pops. My recommendation to you is always refer to Food 52 for everything you don’t know. The Food 52 method is the method I followed. I did this step early because the veggies will be heated again toward the end in the wok, and the rice will be fine to sit there and remain warm while everything else goes down. I got the rice and vegetables steaming and moved on to the sauce. 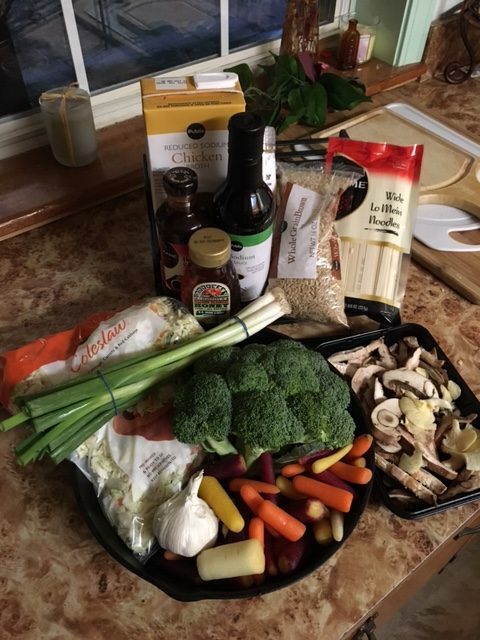 The ingredients you need for the sauce are in the photo: chicken broth, soy sauce, honey (I like orange blossom), hoisin sauce, and ginger (it calls for fresh, but I end up throwing away the rest so I go with the dried). The recipe I used calls for pepper, too. This is up to you. Generally, I followed this recipe. Specifically, I needed to make some adjustments. In the ingredients photo, you don’t see brown sugar or rice wine, but if you have them, I would grab them. They might just save your life…or at least they’ll save the sauce. Time to taste test again. Yuck. It really did taste like pickles. It was reduced by nearly one half by now, so I figured it was time to call in search and rescue (aka, brown sugar and rice wine). Using a whisk, I poured very small amounts of rice wine into the sauce and let it cook. Tasted again. Still tasted like Asian-inspired pickles. A little brown sugar. Cooked some more. Tasted. Getting closer. After an indeterminate amount of time and a mysterious combination of these two ingredients, I ended up with a sauce that was equal parts sweet and sour and had a respectable thickness. Keep the sauce on very, very low heat so it doesn’t congeal. You didn’t forget the vegetables, did you? You can brown the chicken before or after you make the sauce because you aren’t cooking it all the way. You DO want the sauce finished before you put the chicken in the oven, though, so I did them simultaneously. 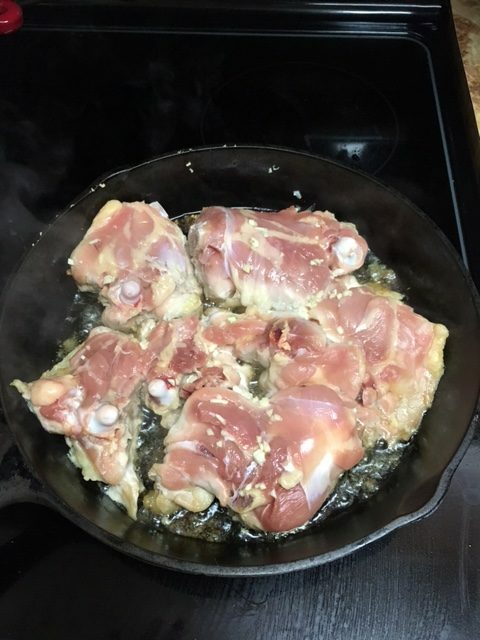 One of my favorite ways to cook chicken thighs with the skin is to brown them skin side down in a cast iron skillet, flip them, and then put them in the oven. The cast iron skillet is key for me. It browns the skin nicely and can be transferred to the oven without a problem. I usually create a seasoning to put under the skin when I do chicken this way. You’ll see over time. This seasoning was simple. I used a mixture of sesame and olive oil (because sesame oil can be overpowering), some chopped garlic, and a little salt and pepper. I don’t cook with a lot of salt so I recommend just a pinch. Season the chicken by pushing the oil and garlic mix under the skin and spreading it as evenly as possible. It will leak out. This is okay. Heat a very small amount of oil in the pan. The idea is to lightly coat the bottom of the pan so the chicken doesn’t stick and allow the oil mixture and the chicken’s natural juices to provide additional oil as it cooks. Before you put the chicken in the pan, be sure the pan is very hot (but obviously not smoking. Set your range to medium high). This also keeps the skin from sticking. When it IS hot, place the chicken thighs, skin side down into the pan (then back up!). Let them cook on this side until the skin is browned to your preference. Tip: Don’t try to pick them up until they’ve cooked for a bit because the raw skin will stick to the pan. If you can’t pick up the thighs from the pan, they’re likely not browned enough. When they’re browned enough, flip them and drain some of the oils and fats that have cooked off. Do not drain off ALL the oils and fats because they help cook the chicken properly in the oven. However, you can see how much there is in the picture below. Drizzle some of the sauce on the chicken (skin side up) and put the whole pan in the oven (set at 350; probably should have said that earlier). As it cooks, you can flip the thighs and add more sauce, but you don’t have to. I like mine saucy, so I did this a couple times. You can see how much of the oil and natural juices from the chicken come out in the pan. This is why you don’t need more than a thin, thin layer of oil to cover the pan. So the noodles take all of four minutes to cook once the water is boiling so they can be the very last thing you do. Just prepare them according to the package instructions. Be sure to put a tiny dab of oil in the water because these like to stick. So we have our partially steamed veggies waiting in a bowl, right? Heat a wok with a very small amount of oil. 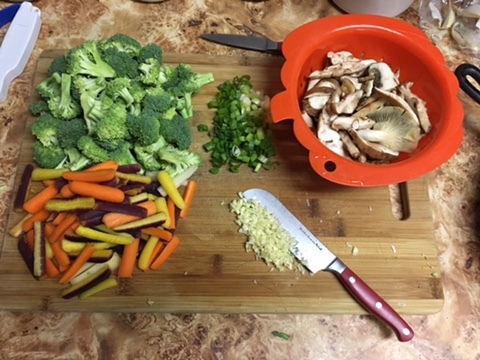 When it’s hot, throw in the rest of the garlic and the carrots, mushrooms, and broccoli. Let them cook, mixing regularly, to the desired doneness. I like mine pretty much “not cooked,” but that’s not everyone’s preference. When they’re close to done, throw in the coleslaw mix, cook a bit more. At the end, toss in the kale, drizzle the whole mix with some sauce, and toss until hot (and the kale is wilted and the sauce is distributed). By now, the noodles should be done. Same with the chicken. Ideally, the sauce will have caramelized and the chicken will have a sticky, crisp skin on top that’s a beautiful dark brown. Close up of the cooked chicken. Note the mostly decorative green onions. Thanks, sis. I like to force my family to create their own meals once I do all the cooking so I set this up in stations. I transferred each element to a serving dish and set them up buffet style. 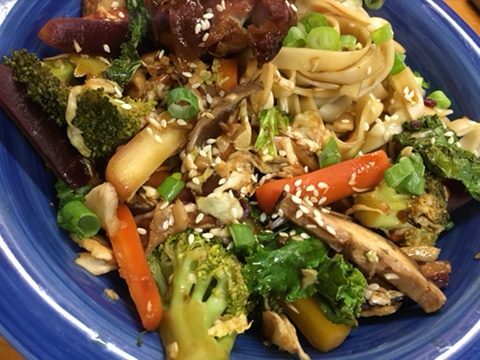 Grab a bowl, put in your choice of noodles or rice, top with veggies, grab a chicken thigh, drizzle extra sauce if you want, sprinkle sesames, drop some green onions, and dig in. The bowl in its glory. Another shot of the bowl. P.S. That’s mostly veggies in there. I promise. I turned to face my ravenous sister and her empty bowl.